Whether we like it or not, we’re in the process of radically changing our healthcare access in America. The House GOP has launched its bill for replacement of the ACA, and it’s a doozy. It assumes something many have tried in healthcare, without success: free-market competition. This is the biggest cognitive dissonance for many conservatives. Supporters of free-market capitalism (which I happen to believe in, for many things) refuse to understand and accept—or even contemplate—that healthcare isn’t something free-market forces can ever govern. Normal market controls simply don’t exist in healthcare. We have limited service and insurance providers, and that’s only going to worsen in the coming decades. The town (of 26,000) I just moved to has only two medical groups. Even with insurance, I cannot get a regular doctor; one practice isn’t accepting new patients and the other turned me down. I will have to drive nearly TWO hours to find a doctor. There aren’t enough doctors and hospitals, and insurance providers have little incentive to compete, especially in a poor risk pool or poverty-stricken region—so rather than a real effort to negotiate, they will drop out of a market if it’s not profitable enough. (Key word: enough. They could usually make a profit, but corporate greed requires a YUGE profit.) And even if insurance companies negotiate lower prices, they don’t pass savings on to the patient; they pocket it. The customer has ZERO negotiating power. The woman having a stroke, the unconscious car wreck victim, or the dad with the feverish, vomiting child cannot walk away…even if they knew up front it would cost their house or life savings. If insurance doesn’t pay, we will go bankrupt trying to. We will never willingly make those decisions for ourselves or loved ones based on dollar signs. Ever. That’s a cruel and barbaric thing to ask of anyone. It’s not like choosing a beauty salon or peanut butter brand. It’s life and death. 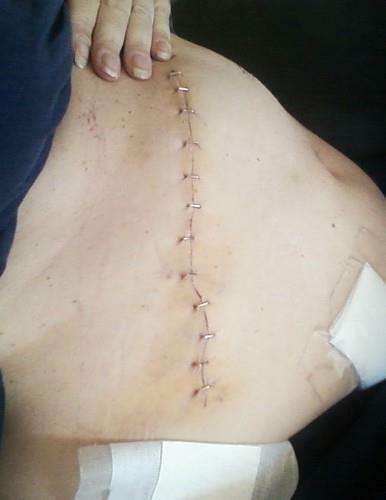 I had emergency gall bladder surgery a couple years ago. I would have died without it. It cost over $50,000. Even if I had the ability to shop around, it would have made little difference if I had saved a thousand or two. So ultimately, the really baffling and infuriating part of the healthcare debacle is that it’s 2017 and we’re still the only “great” country arguing whether life is a privilege or a right, despite that pesky document that answered the question centuries ago. The majority agree that food, housing, utilities, safety, transportation, and education are fundamental needs, and accessibility a societal obligation, because we realized long ago that meeting those needs is required for a successful nation and provides a net benefit to society. But somehow, we cannot fathom that failing to keep people alive and healthy—working, raising families, contributing to society—or allowing a catastrophic illness or accident to ruin them, makes all of those other things we consider rights a moot point. Instead, many are willing to watch families and lives lost, and with them, our nation…all for want of a Band-Aid. This entry was posted in Lauren and tagged ACA replacement, American healthcare, family, insurance providers, privilege versus right. Bookmark the permalink.